It wasn’t quite a family pot, but seven players saw a flop of J 9 2 . Action was checked to Duy Le and he fired 125,000. Michael Mizrachi was the only caller and the two saw the 7 on the turn. Both players checked and the river was the J . They checked again and Mizrachi tabled 6 6 . Le mucked and Mizrachi took down the pot. He was at 5.8 million after the hand. Gabriel Alarie raised to 115,000 from the cutoff and Edward Ochana made the call from the button. The flop came down Q J 5 and Alarie checked. Ochana fired 140,000 and Alarie raised it up to 440,000. Ochana then repopped to 1.4 million. Alarie had enough and mucked. Ochana then turned over 5 5 for a flopped set. He was up to 5.8 million. 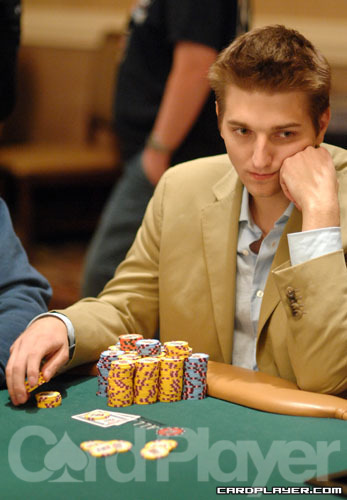 Todd Witteles moved all in for his last 126,000 and Evan Lamprea tried to isolate by three-betting. But Niklas Toorell made the call to create a side pot and the flop came down J 8 3 . Both players checked and the turn was the 3 . They checked again and did the same when the 7 fell on the river. Witteles showed A 9 for complete air. Lamprea showed A Q and it was good enough to take it down, sending Witteles out of the tournament. We caught up with this hand on the river. The board had run out J 10 9 8 2 and Benjamin Statz bet 500,000. Jacobo Fernandez looked him up and Statz showed K 4 for the king-high flush. Fernandez tabled 7 5 for a lower flush and he slipped to 900,000. Statz was at 3.1 million. Theo Jorgensen limped in from the small blind and Duy Le checked from the big blind. The two saw a flop of A K 6 and they both checked. The turn was the 3 and Jorgensen bet 50,000. Le made the call and the river was the Q . Jorgensen bet another 100,000 and Le mucked. 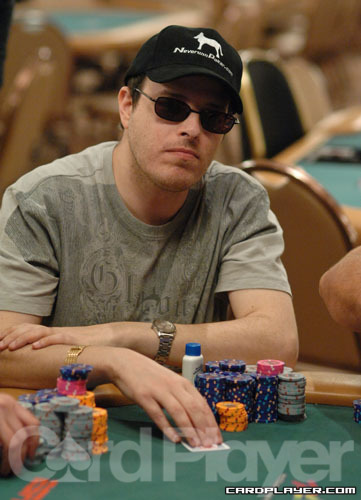 Jorgensen took down the pot and was at 8.45 million. Darrell Dicken bets $35,000 and is called by Cuong Nguyen and Gabriel Alarie. The flop comes 8 7 5 and Dicken bets out $100,000. Nguyen folds and Alarie raises all in. Dicken makes the call and shows 10 10 . Alarie turns over 9 7 . The turn is the J and the river is the Q . Alarie is eliminated in 20th place, earning $17,292.